Our online store for My Job Depends on Ag decals is temporarily closed while we streamline our order fulfillment process. Decals can temporarily be ordered by direct mail. The cost is $5 each, + $1 for shipping and handling. Please make checks payable to My Job Depends on Ag and mail to P.O. Box 128, Firebaugh, CA 93622. Shop our CafePress store for T-shirts, caps, mugs, auto accessories, kid’s items & more! Thanks to Gar Tootelian Inc., these garden/yard signs are available free of charge. 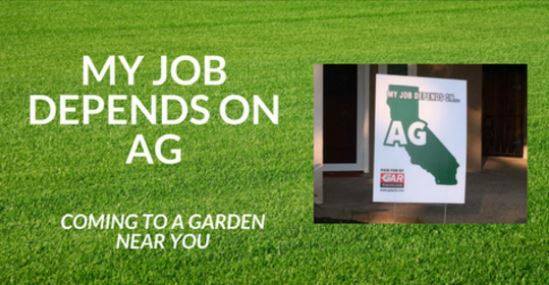 Proudly place a sign in your yard or place of business to let others know that you understand how important agriculture is to your community and nation. To receive your free yard sign please request by email here > requestmysign@gtipros.com. These signs are not provided by MJDOA and can only be obtained by requesting at the email address above.